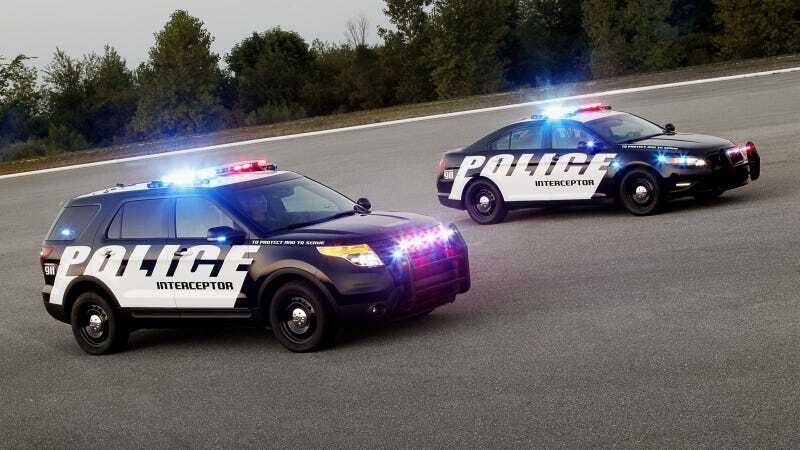 While wins three years running is a point of pride for Police Interceptor sedan, the results of the utility vehicle tests are noteworthy, both for the industry and Ford, because Police Interceptor utility represents an increased percentage – now 60 percent – of Ford police vehicle sales. "Not only do we remain faster, but agencies like the Los Angeles Sheriff Department see the benefits of all-wheel drive and EcoBoost," said Arie Groeneveld, Ford chief engineer. "In pursuit driving conditions, being able to put down 365 horsepower is best accomplished using our intelligent all-wheel-drive system – which optimizes handling and traction in all driving conditions, including dry-pavement surfaces – as demonstrated in LASD testing." The performance achievement of Police Interceptor sedan and utility confirms two major shifts in police vehicle trends Ford is leading since its introduction last year of the all-new Police Interceptor family – the overwhelming preference by police agencies for Ford's intelligent all-wheel-drive system, and a growing preference for the spacious utility vehicle. Since launch, Ford Police Interceptor sedan and utility vehicle, which replaced the venerable Crown Victoria, have seen significant sales increases – sedan sales are up 34 percent in calendar year 2013, while utility sales are up 142 percent. Today, Ford Police Interceptor utility vehicle is only available with all-wheel drive, while 88 percent of Police Interceptor sedan volume is all-wheel drive (base 3.5-liter Ti-VCT sedan can be ordered with front-wheel drive, while the 3.5-liter EcoBoost-equipped version is standard all-wheel drive). Groeneveld said the LASD tests demonstrate police agencies don't need to sacrifice performance for the added space and versatility a utility vehicle provides. Beyond obvious traction advantages proven through all-wheel drive, evaluations like the LASD and Michigan State Police tests earlier this year demonstrate that Ford's intelligent all-wheel drive enhances handling, especially in pursuit situations. The Ford EcoBoost-powered Police Interceptor sedan bested both competitors' high-performance V8 sedans in 0-100 mph testing. Preliminary results of LASD testing show the fastest of the fast – the 2014 Ford Police Interceptor EcoBoost sedan with standard all-wheel drive – posted a 0-100 mph time of 14.2 seconds, compared to 15.2 seconds for the 5.7-liter Hemi-equipped Dodge Charger with optional all-wheel drive, and 14.4 seconds for the Chevrolet Caprice with 6.0-liter V8. The LASD tests were conducted with the utility vehicles carrying 400 pounds of cargo to simulate real-world conditions. The all-wheel-drive-equipped 3.5-liter EcoBoost utility turned in a 0-60 mph time of 6.5 seconds and 0-100 mph time of 18.3 seconds. The Chevrolet Tahoe with 5.3-liter V8 returned an 8.5-second 0-60 mph time and a 0-100 mph time of 26.4 seconds. Even the base Ford Police Interceptor utility, equipped with a 3.7-liter V6 and all-wheel drive, beat the competition by posting a 7.9-second 0-60 mph time and 23.6 seconds in the 0-100 mph contest. Not only did the Police Interceptor sedan and utility prove fastest in a straight line, both also posted fastest average lap times in their segments. The EcoBoost sedan (at 81.25 seconds) is 0.7 second faster per average lap than Chevrolet Caprice 6.0-liter V8 with rear-wheel drive (at 81.97 seconds), and 0.9 second faster per average lap than the all-wheel-drive-equipped Dodge Charger with Hemi V8 (82.19 seconds). Ford Police Interceptor utility with EcoBoost (85.58 seconds) is 6.1 seconds faster per average lap than Chevrolet Tahoe (at 91.71 seconds). Ford Police Interceptor vehicles are gaining attention with agencies nationwide as a means of balancing law enforcement's need for speed in pursuit-rated vehicles with the need to save money. Switching from traditional V8-equipped police vehicles to powerful but more efficient Ford EcoBoost V6 vehicles achieves this goal. With Ford's announcement in September of a new non-pursuit-rated, fuel-efficient 2.0-liter EcoBoost-equipped Special Service Police Sedan that achieves 30 mpg highway, the company now offers law enforcement agencies the power of choice when they want to optimize efficiency and power.